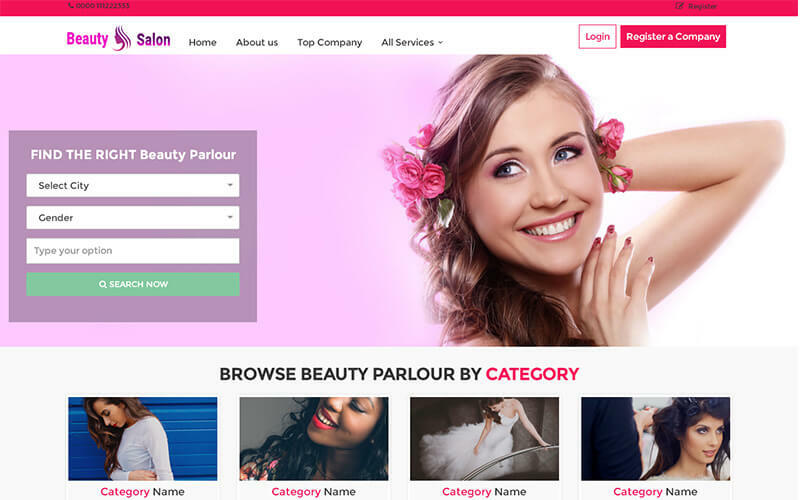 To oversimplify, the Beauty Parlour Booking Script PHP Scripts Mall has developed the best and essential way for the beauticians and make-up artists to take over their business online by using simple readymade clone script. This readymade Beauty Parlour Script is developed with real-time booking script with user-friendly and mobile-friendly customization. The scope of the online beauty parlour booking is now high on-demand and emerging among the business entrepreneurs to kick-start their business to the global or localized level. The people are gets attached to the digitalized world and they have no time to spend for making their personal looks and necessity, so this script will make them book their appointment or schedule to spend for their personal looks or fashion. This Appointment Booking Software is made with authenticating login portals where the user and parlour owners can register their account with their valid mail id and password, they can log in to the account from anywhere at any time, the home page has advanced quick search box filter where the user can search their parlour by entering the city, parlour category and genders etc. where the user can get the accurate responsive search results and also at the center of the home page can view the total number of the users, total beauty parlour and reviews. It is best and efficient booking script for the users to make an appointment by seeing the details, experience, and reviews of the parlour. Our Salon and Spa Booking Script is the best parlour directory for the owners to make their company to the next globalized level with high return on investment, the beauty parlour owners can enroll their business with a proper company license, company name, details, images, business hours and contact details etc. The site can be customized as per the user requirement. The Beauty Parlour Booking Script has another portal that is the admin where it is known as the supreme portal where all the managing and controlling options are handled by the admin. The admin can approve or decline the user booking request and parlour owners company listing request, we have also integrated the revenue models for the admin to generate profits by using the banner ads, Google ads and other ads in the script. We have followed all the standard methods for the optimization, and to make SEO-Friendly customization site. We are sure that this script will make your business level promotions to next globalized level with mobile-friendly customization. We have 4000 plus clients all around the globe with good brand mark experience in developing the web design and development, in creating cloning scripts, creating the brand-free site, and also we offer 6 months free update services, SEO-friendly URL for the site and 24×7 technical support team help for your solution. Basic and Advanced Search options, Beauty Parlour list with clear details, Top Beauty Parlour, Beauty ParlourBooking, Appointments management, Location Management, Category Management, Beauty Parlour Management, Review Management, Ad Management, User Feedback Management. Beauty Parlor Booking Script is a wonderful script which fulfilled my passion into a profession. Ultimate UI makes my clients relationship good. This script entirely changes my life into a fashion world. It works smoothly which gets me to my customers so easily. Dream comes true with this script. I can reach to the people through this online booking makes me to earn high. Thank you for the team who helps me a lot in the needed time.